Nashville is the capital of Tennessee and the center for country music, publishing, banking and transportation industries. It is one of the largest and fastest growing metropolitan areas in the region, so there are many inexpensive and exciting sites to see during your stay. Tennessee State Museum – Located on 505 Deaderick Street, this is the perfect first attraction to visit when you first land in Nashville to learn all about the state of Tennessee. It first opened in 1817, featuring a life-size painting of Andrew Jackson, a great American war general and the seventh President of the United States. The permanent exhibitions include pieces from "The First Tennesseans" and "The Frontier." The temporary exhibitions showcase more pieces from the Civil War era, as well as a new traveling exhibition titled, "The 50th Anniversary of the Tennessee Civil Rights Sit-Ins: We Shall Not be Moved." Admission: Free. The Warner Parks – The Warner Parks consist of Edwin and Percy Warner Parks, named after members of the Nashville Park Commissioners. With over 2600 acres of land, these parks are perfect for hiking, horse-riding, golfing, and cross-country running. There are also many public, educational programs offered such as Sunday Afternoon Nearby Nature Canoe & Kayak, Fall Scavenger Hunt, Owl Prowl, and Beetle-Mania. Be sure to check the schedule and register for these special events. Admission: Free. Lane Motor Museum – If you love cars and motorcycles, visit the Lane Motor Museum to see the largest European collection of them in the United States. It also features vehicles from Asia and North and South America, with 150 cars in total. Some of the featured cars include the A.B.C. from 1922 and a Volvo 144 from 1971. Keep your eye out for a car that runs on a propeller or a car that folds in half. All the vehicles at the museum are expected to be in working condition. Open daily. Admission: $9. Radnor Lake State Park – Numerous hiking trails of all difficulty modes from easy to strenuous cover this state park. During your daytime walks, you can see wildlife and various species of plants in their natural habitats. You can spot frogs, turtles, lizards, snakes and geese. Wildflowers, fungi, ferns and mosses also inhabit the area. The park also offers canoe floats from Memorial Day through Labor Day and special programs such as astronomy night hikes or programs on snakes and cave ecology. Admission: Free. Frist Center for Visual Arts – Head on over to the Frist Center for Visual Arts to see works from local artists, as well as fine pieces from international artists. Exhibitions include "Abstractometry" in which Nashville artists use geometric shapes to construct abstract thoughts in portraying how concepts such as architecture and language influence our lives. Another exhibition is "Garbage Matters," in which artist Vik Muniz uses the arrangement of everyday materials to create surprising, and yet aesthetically pleasing images of how humanity is stricken with issues such as poverty and waste. Admission: $7 for college students with ID, $10 for regular adult admission. Belmont Mansion – The Belmont Mansion was once the home of Adelicia Hayes Franklin Acklen Cheatham who built the home with her husband Joseph Alexander Smith Acklen, who was a Mexican War hero. Adelicia once inherited the property from her previous marriage, and together, they envisioned an Italian-style villa built by gardens with outbuildings, a two-hundred foot long greenhouse and conservatory, art gallery, bowling alley, bear house, and zoo. Today, it is the largest house museum in Nashville and offers a general house tour in additional to a Gardens and Historic Buildings Tour, Art Tour, and Mount Olivet Cemetery Tour. Admission: $10. Music City Roots– Have you ever been to a live radio show? If not, be sure to check out Music City Roots, a weekly two-hour radio show featuring Nashville artists of a variety of musical genres whose performances are broadcasted worldwide. Playing live from the Loveless Café & Barn are artists such as Amy Speace, Water Liars, Donna the Buffalo, and Elephant Revival who play country music but focus on sub-genres such as folk, alternative and bluegrass. Admission: $5 for college students with ID, $10 for regular adult admission. 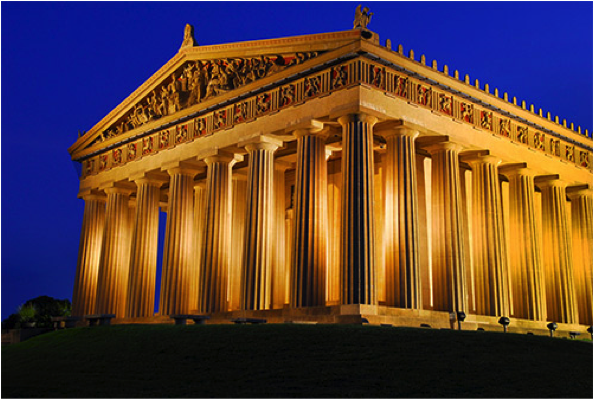 The Parthenon – The Parthenon, located at the center of Centennial Park highlights a statue of Athena, one of the most powerful goddesses in Greek mythology. 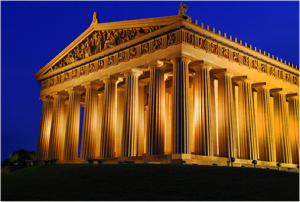 Both structures are full-scale, breathtaking replicas of those in Greece. While you are there, you can also visit the art museum, showcasing pieces from temporary exhibits, as well as a permanent collection of 63 pieces of 19th and 20th century American art. Admission: $6. Fairgrounds Speedway Nashville - If you get a thrill from watching high-speed cars racing, then the Fairgrounds Speedway is the place to visit. It first featured horse racing in 1904. In its following years, this track has held NASCAR Grand National/Winston Cup races and it is the second oldest operating track in the country. A special race is arranged at the Tennessee State Fair, which has been running for over 100 years. Admission: $10. Printer's Alley – Printer's Alley is most historically known for the city's printing and publishing industry, which boomed within the premises. It also became an epicenter for restaurants, saloons, and nightclubs with touches of Victorian-style buildings and southern flair. Famous country music artists have performed in the area, which include Chet Atkins and Dottie West. Today, you can listen to live blues music at "Bourbon Street Blues and Boogie Bar" or sing karaoke at "Ms. Kellie's." Admission: Free.